"Tender chicken morsels in an easy and delicious sauce made with fresh ginger and plum sauce. 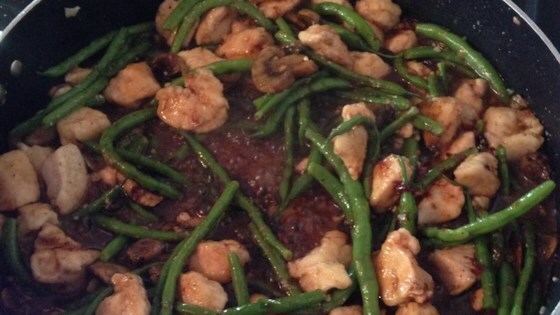 I use snow peas and mushrooms, but you can add whatever veggies you have on hand (and are a must for your stir fries)!" Bring the rice and water to a boil in a pot. Cover, reduce heat to low, and simmer 20 minutes. Mix the plum sauce, corn syrup, soy sauce, garlic, and bouillon in a small bowl. Heat oil in a skillet over medium heat. Coat the chicken in cornstarch, and cook 5 minutes in the skillet, or until juices run clear. Mix in ginger, snow peas, and mushrooms, and continue cooking until tender. Stir in the plum sauce mixture. Cook until heated through. See how to make saucy oven-fried chicken wings. Good. I found a similar recipe that calls for only 1/4 cup of corn syrup (or golden syrup) which seemed a *much* less scary quantity! It also uses water chestnuts instead of mushrooms. A very good taste. I would add some more veggies with this one. I also made coconut rice which was a wonderful addition to this. mmmmmm Yummy flavours. I admit I did add a bit more ginger then called for, omitted the syrup and added a few chili peppers. Turned out great !! !